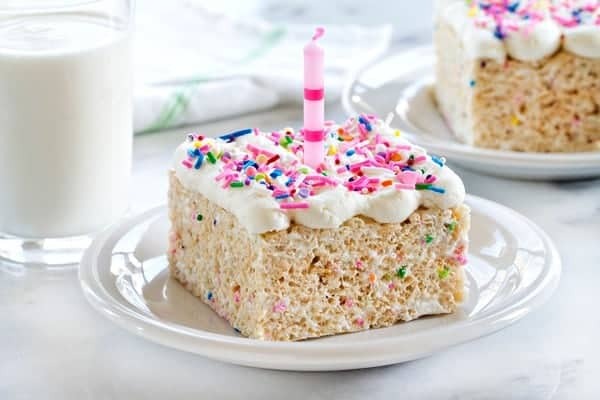 Birthday Marshmallow Cereal Treats are topped with buttercream frosting and loaded with sprinkles. They’re over-the-top in the best kind of way and perfect for just about any celebration! We celebrated our little babe’s 2nd birthday this month and I seriously can’t believe how quickly two whole years have flown by, yet it’s so hard to remember life before her. We had a large, kind of fussy birthday party for Elle last year, and although it was amazing, we decided to keep things simple this year with a small celebration at home. Even though we were keeping it small, I still wanted to make it special. Since she’s all about farm animals and barns right now, we opted for cute, farm themed invitations and decor from Minted along with loads of helium balloons. And since I am most definitely not a cake or cookie decorator, I ordered both of those items from a local bakery and they turned out every bit as amazing as I had hoped. Although I love to cook, bake, and host friends and family, I didn’t want to be stuck in the kitchen stressing over food and a sink full of dishes during Elle’s party. Ain’t no one got time that when there’a little babe turning 2! Instead of stressing, we had small spread of food catered in from Famous Dave’s and it was just perfect. Everything was set up buffet style on our island and it was pretty delicious, so I’m definitely happy we went that route. 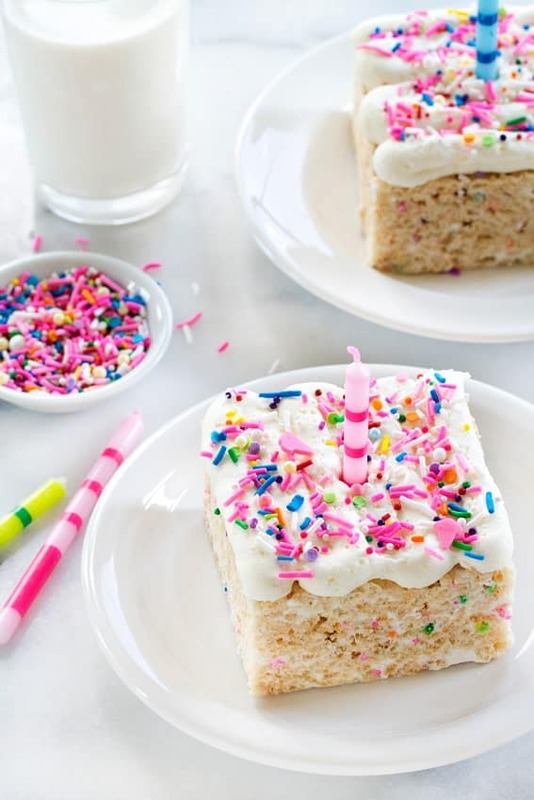 Elle’s party was not on her actual birthday, so we had a tiny celebration at home complete with Oreo Cheesecake and these adorable Birthday Marshmallow Cereal Treats. I was going for bakery-style when I whipped these up and I think I achieved just that! 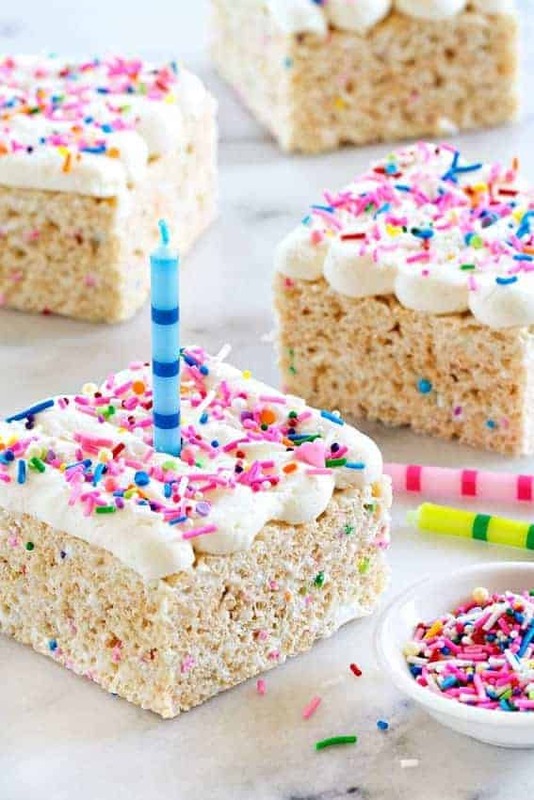 Sure they may be a little over-the-top since they’re pretty huge, loaded with marshmallows and sprinkles, and topped with vanilla buttercream, but that’s what birthdays are all about. Right? I’ve partnered with Emily from Jelly Toast and Campfire® Marshmallows to create recipes to share with you in 2016! 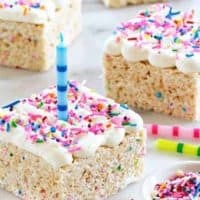 If you’re looking for more delicious birthday inspired treats, you won’t want to miss this Marshmallow Frosting or these Birthday Cake Cookies! 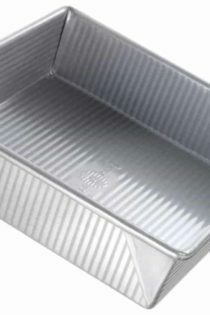 In large pan, melt butter over low heat. Set aside 1 1/2 cups marshmallows. Add the rest of the marshmallows to the pan and stir until completely melted. Gradually add crisped rice cereal; stirring until well coated. Fold in the reserved 1 1/2 cups of marshmallows and sprinkles until thoroughly incorporated. With the mixer on low speed, slowly add in powdered sugar, and continue beating until well blended. Add in vanilla, and 1 teaspoon of milk. Mix on low speed until incorporated. Beat at high speed until frosting is smooth and fluffy; about 4-5 more minutes. If your frosting is too thick, gradually add a little more milk, 1 teaspoon at a time until you reach the desired consistency. 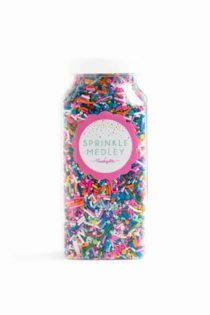 Spread or pipe frosting onto cooled marshmallow cereal treats and top with festive sprinkles. I cut these Birthday Marshmallow Cereal Treats into 9 large pieces. I then piped the buttercream in a zig-zag pattern using a Wilton 2a piping tip. Oh my yumness! These look so delicious it’s crazy! So sweet and delish! Oh my good grief, these are gorgeous! So big and fluffy, which is what i LOVE!! Yeah, I’ kind of a lover of big and fluffy cereal treats as well! Thanks so much for stopping by, friend! seriously, I agree with Kristan…I’m in love with these!!!! <3 so beautiful! Thanks so much, Julie! They are so darn good too. Hi, Lisa! The time goes by so quickly, doesn’t it? Amazing though! These are so colorful and fabulous! Love!! Hi, Aimee! I hope so, too! These are just so pretty and pink and girly!!! Loving that marshmallow fluff on top. I want to sink my teeth into it! My daughter is not a big fan of cake so I always make her something else for her birthday. 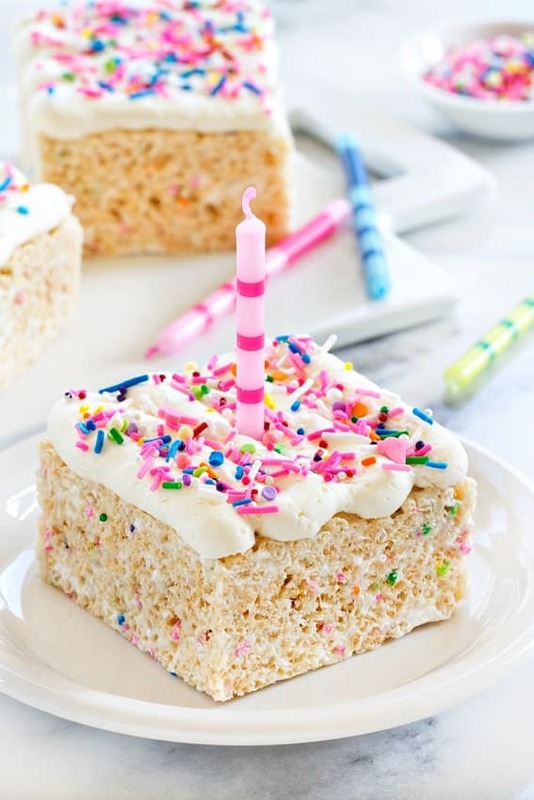 I’ll have to put these crispy treats on the list for next year’s birthday! They’d be just perfect, Nicole! Thanks for stopping by! 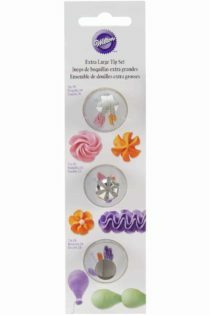 These look like the prettiest things ever! !